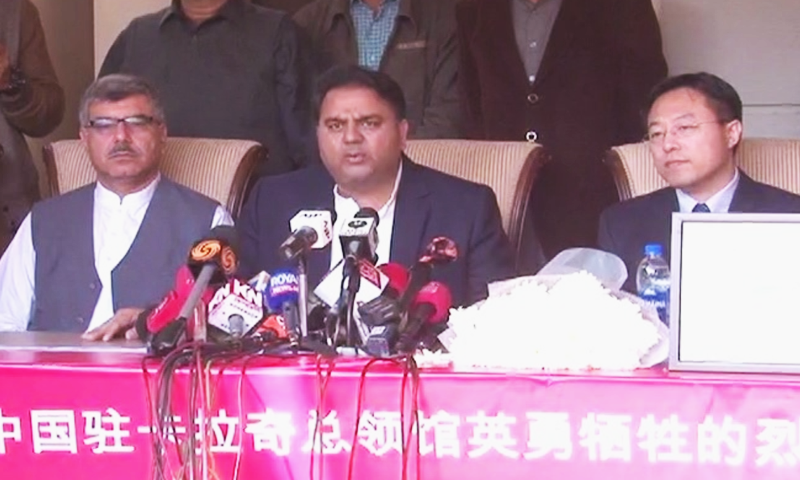 Chinese Deputy Chief of Mission Lijian Zhao and Information Minister Fawad Chaudhry address a donation ceremony in Islamabad organised by a community of Chinese citizens. On Monday, Lijian Zhao, Deputy Chief of Mission of the Chinese Embassy in Pakistan made known that a Chinese citizen wished to donate one month’s salary to the families of the policemen who were martyred in last week’s dreadful attack on the Chinese Consulate. Zhao claimed that the donor believed that the tragic event would not hinder Pak-China relations and that their friendship is not just on an economical front but is “rooted in the hearts of the people of the two countries”. A heartfelt event was voluntarily organised in Islamabad by a community of Chinese citizens residing in Pakistan. At the event, many Chinese men and women stood in solidarity to show their appreciation and respect for the men who sacrificed their lives to save others. The Information Minister of Pakistan was also present at the event and was thanked by Zhao for representing the country and proving that the friendship between Pakistan and China was left unimpaired by the attack.